As fourteen children from the Calais `jungle’ arrive at Croydon for `processing’, one can only imagine some of the journeys and experiences that have brought them to this point. But that imagination will be helped on its way by viewing A Man of Good Hope, the latest and perhaps most remarkable music theatre from South Africa’s Isango Ensemble. Formed sixteen years ago in Cape Town by Mark Dornford-May and Pauline Malefane, Isango are a company from the very roots of South Africa, whose members are drawn from its townships and who at every turn when they’ve visited the UK – first with The Mysteries (Yiimimangaliso), with uCarmen and later The Magic Flute (Impempe Yomlingo) – have shown they stand comparison with the best that musical theatre and opera have to offer here. Indeed The Magic Flute went on to win an Olivier for Best Musical revival. A Man of Good Hope, though, is something else. Based on Jonny Steinberg’s equally remarkable book, Steinberg tells the tale of Asad, a young man caught up in Somalia’s civil war. 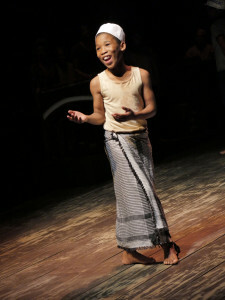 Asad – played with shining face assurance by young Siphosethu Juta making his stage debut – sees his mother, at the age of eight, shot in front of him. From then on, his life is a series of attempts to stay alive and safe as he makes his way picking up odd jobs, living on the streets, through Kenya, Ethiopia, to eventually reach Cape Town. He just narrowly escapes death when the Somalis he’s found work with are attacked by South Africans – racism as ever raising its ugly head in circumstances of strained unemployment. Told partly in text but also sung through accompanied by marimbas, drums and any other vocal sound required made by the 25 piece ensemble, Dornford-May’s production is a model of economy yet full bloodied exuberance, choral excellence and not a little wit. Like refugees and migrants everywhere, at all times, hope springs eternal and the safe harbour is always just beyond the horizon. For Asad and his adopted mother, the bright and shining destiny is America – a land, they sing where `everybody is rich and there are no guns’ – a line that brings an ironic ripple of amusement. In the show, Asad reaches a momentary safe place, creating a `family’ with a new partner and child. In real life, the young man Steinberg found on the streets in Cape Town was a hustler, living hand to mouth. But by what wonderful transmutation, Asad’s story has now taken on universal status. Such is the power of art. And such, one hopes somewhere down the line, Steinberg’s telling of his story will also have helped transform Asad’s life and that of many others. First perf of this production of A Man of Good Hope at Young Vic Theatre, London, Oct 6, 2016. Runs to Nov 12, 2016. 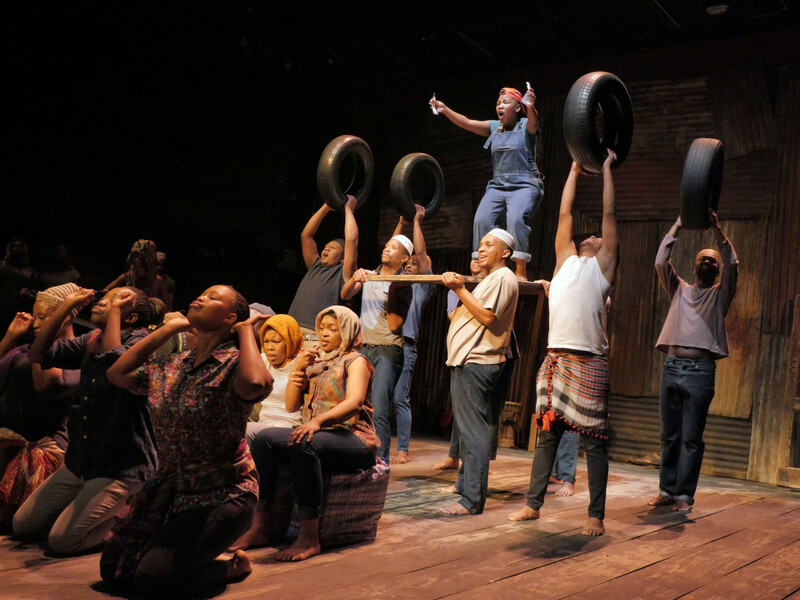 This entry was posted in 2016, Reviews and tagged Isango Ensemble, Mark Dornford-May, music/opera theatre, Pauline Malefane, young Somali refugee, Young Vic Theatre on October 17, 2016 by Carole Woddis.